Rebel fighters say they were advancing toward ruler Moammar Gadhafi's compound on Sunday, as gun battles and NATO airstrikes were reported in parts of the city. NATO for months has conducted airstrikes in Libya under a U.N. Security Council resolution authorizing force to protect Libyan civilians. Libyan rebel representatives claimed that rebels captured Saif al-Islam Gadhafi and Saadi Gadhafi, two of Gadhafi's sons, on Sunday. A rebel spokesman in Libya said early Monday that rebels were in control of most parts of the capital, while a Libyan government spokesman said hours earlier that some areas of eastern Tripoli were out of government control Sunday. An anchor giving the news this weekend on Libyan state television lifted a gun on air and warned rebels trying to oust Moammar Gadhafi that staffers at al-Libiyah would become martyrs if they had to. Hala Misrati grabbed a handgun from the top of the anchor desk as news reports said that rebels were advancing toward the Libyan capital of Tripoli. Al Jazeera English gave this translation: "With this weapon, I either kill or die today. "You will not take al-Libiyah channel. You won't take Jamahiriyah channel, Shababiyah channel, Tripoli or all of Libya, and even those without a weapon are willing to be a shield in order to protect their colleagues at this channel. We are willing to become martyrs." According to several reports, Misrati has been controversially outspoken about her support of Gadhafi. She previously reportedly referred to al Jazeera as "Swine Jazeera" and accused the news agency of killing its own employees and bombing its own offices. 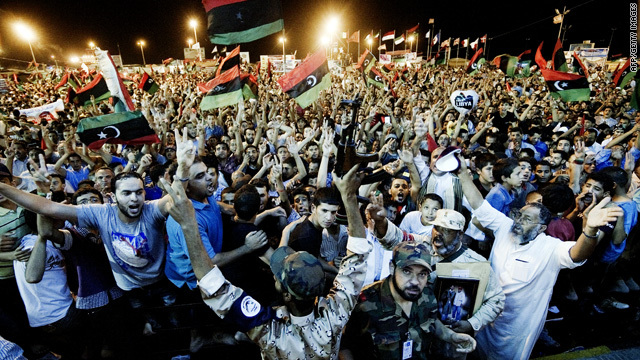 Tens of thousands of Libyans in the rebel stronghold of Benghazi celebrate the rebels' advance into the capital, Tripoli. A NATO spokeswoman said Sunday that Libyan leader Moammar Gadhafi's "regime is crumbling," as rebels in the Libyan capital of Tripoli said they were advancing on Gadhafi's compound. The developments came on a night when Libyan rebel representatives claimed that rebels captured Saif al-Islam Gadhafi and Saadi Gadhafi, two of Gadhafi's sons. Here are some of the latest developments of the fighting in Tripoli, the latest installment of battles in a months-long uprising in Libya.